I began this post on fear about two years ago. What in the whirl? How can something I wrote two years ago resonate with me still!? I am able to just pick up and continue writing because it’s that relevant. So relevant…like the first thing I thought of was me sitting poolside at my sister-in-law’s house a few days ago and decidedly moving myself inside because there were bats (yep, you read that correctly) swooping and flying around the pool. I’m skeered of birds. I watched the Alfred Hitchcock movie, The Birds, when I was a little girl (The babysitter was OK with it. Why not?) and I want them to stay at a beautiful distance from me. You want to get me itchy, feed the birds while I’m sitting in my beach chair trying to relax. Maybe you need these words today, too. Maybe that’s why I had it in drafts and never published it. It was waiting for me to finish writing it today ’cause you know, timing is everything. Have you ever just sat dumbstruck and flabbergasted over life? The hits just keep coming. You begin to wonder if there is a big red target on your heart and soul. There is. Satan has us marked for destruction. If God would have allowed it, he would have ended our lives before we sucked in our first breath of air. Satan is a liar and thief. Now that thought often gives me a shiver. I can get real worried about what’s next. Just being real here, the prince of darkness can dim my light sometimes by a mere whisper. Those of us in ministry often feel our target is bigger. But wait, aren’t we all called to be a functioning part of the body of Christ? So there goes that excuse theory. I’m hoping there are a few of you out there that are shaking your heads with an amen, even if it’s a nervous one. For God did not give us a spirit of timidity or cowardice or fear, but [He has given us a spirit] of power and of love and of sound judgment and personal discipline [abilities that result in a calm, well-balanced mind and self-control]. Oh, and maybe another moral to this story is to not put things into your mind that you will probably never get out. I have several things like that and I’m praying God will pull that stuff up by the roots! Obedience brings all kinds of good blessings. I know all those things, but sometimes I need reminding. Oh friends, I have felt like a little beach bungalow battling some wind, waves and floodwaters and I bet you have too. Jesus wasn’t playing when he said that in this life, we would have trouble. I shook and quivered. Groans and moans could be heard as I fought to stand firm on Christ, our Solid Rock. Trying my best to keep from collapsing in a big ole pile. The hope I clung to was knowing I had a relationship with Jesus. 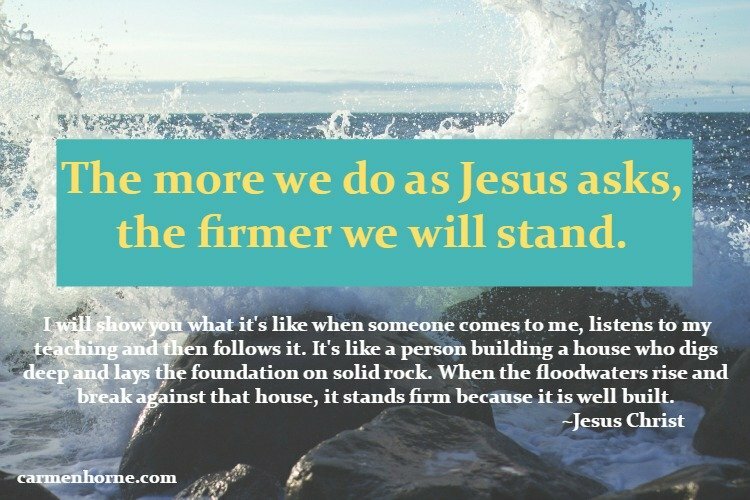 The more we do as Jesus asks, the firmer we will stand. When the wind calmed, I was still standing. A little weather worn, but still standing. Maybe you know your foundation is weak, start firming it up. The materials needed are those that build your relationship with Jesus – prayer, Bible study,and becoming a doer of the Word and not just a hearer.3 Let me tell you, it will much more comforting to know you’ve been building on the Solid Rock, before the wind starts blowing. As the winds of life swirl around you, plant you feet firm. Call on Jesus.